When you start your YouTube channel it may seem like it’s impossible to get views on your videos! It’s not easy and you probably won’t be an overnight success, but it definitely is possible. I have a video on my channel that has over 740k views and I have many more videos that have over 10k views. Throughout my years of running a YouTube channel I have been able to experiment with strategies to find out how to get more views on YouTube for both myself and my clients. In this post I’m going to teach you how to get more views on YouTube using 6 different methods – all for free! You have to use ALL of these tactics together to have the best results but even focusing on one of these points will bring you noticeable results over time. SEO stands for Search Engine Optimisation. It is the process of making sure that search engines know what your video is about so it shows up in the search results when someone searches for it. Learning how to optimise my content so it was discoverable on YouTube and Google was one of the most important lessons in my YouTube journey. I use a tool called Tubebuddy to help with my video SEO, it’s one of the best tools I have ever used for my YouTube channel and you can get it for free! I personally use the paid Star package because it saves me countless hours with bulk editing but the free version is more than capable of helping you improve your YouTube SEO. Read my Video SEO For Noobs explained Ebook to learn more about SEO and how to use it to get more views and subscribers on YouTube. One of the biggest mistakes I see new YouTubers make all the time is uploading videos with no plan or objective. Mindlessly uploading a bunch of videos will most likely end up in those videos getting little to no views and you being demotivated. Instead of randomly posting videos you need to be using a content plan. A content plan is exactly what it says on the tin – a plan for your content on your YouTube channel. If your goal is to get more views on YouTube then you need a content plan that reflects that goal. If you’re putting out 5 videos a week then your basic content plan should include 3 help videos to capitalise on search traffic and 2 hub videos for your subscribers. Help content can include how-to videos, tutorials and informative content that helps the viewer. This will bring you views and traffic from people searching for solutions to their problems on Youtube (if you’re using SEO effectively). Hub content is stuff like livestreams, vlogs, let’s plays and other types of content your subscribers would enjoy. This is content made for people who already know and like you. This type of content is unlikely to bring in a new audience or rank in search results but it’s essential to building a community and a YouTube channel that is successful in the long term. A common mistake I was guilty of when I first started out on YouTube was not making enough content. I would put out a video and wait to see if it did well and then put out another video if it did. If it didn’t do well then I would be disheartened and possibly not put out another video for a while. I see people repeating this mistake all the time! The fact is that just because a video didn’t do well in its first day, week or month doesn’t mean it won’t do well over time. You need to stop being concerned about how well your videos do when they’re first released and start thinking about how well they may do in 6 months or a year. Obviously it’s not smart to wait 6 months or a year to put out your next video, so keep pumping out content regardless! Many videos that I didn’t think were going to do well on my channel ending up bringing in hundreds of thousands of views over time. My most viewed video “How To Write A Rap Song” brought in 7 views in its first 24 hours and is now sitting at over 740,000 views and growing. It’s simple math honestly. Putting out more videos will result in your YouTube channel bringing in more views. Think of your channel as a business and use long tail strategy: instead of trying to make one video that gets 1,000,000 views try and make 1,000 videos that get 1,000 views. The latter is much more likely and attainable, plus when you’re busy focusing on creating 1,000 videos you’ll probably create a few videos that get a couple hundred thousand views. The more videos you make, the more opportunities you will be creating to having a video that pops off and brings in a large amount of traffic. Evergreen content is content that will still be relevant a year or maybe 5 years from now. This post I’m writing right now is an example of evergreen content, everything I’m teaching you right now will be relevant in a few years as long as YouTube doesn’t shut down. If the YouTube algorithm changes drastically and anything I’ve said needs to be changed then I can simply update the post. You can create update videos if any of your evergreen videos become outdated also. Updated videos are a great way to bring in views and traffic to your channel, especially if the original video was successful in bringing in views. Trending videos or content based around current events and trending topics can bring a burst of views to your YouTube channel, but this is not the most sustainable strategy to get more views on YouTube. Working trendy videos into your content strategy is a valuable tool as you can gain new subscribers that may watch the rest of your content in a short amount of time. I use trending videos in the form of patch notes on the games that I am currently playing on my channel. This type of content is incredibly useful for people within the first few weeks of the release of a new patch or game update, but it quickly loses its relevancy. You may get a few views on these videos over time, but it’s doubtful that you will gain any significant amount of traffic to your channel. I suggest using trending videos as part of a larger content strategy to bring in new subscribers and introduce people to the rest of your content. When you share your videos online don’t just share the single video. Share the video with the playlist it is a part of. This will allow you to get more views on the rest of your related videos by making it easy for viewers to watch more of your videos. To share your video as well as it’s playlist you can view the video in it’s playlist and use the long link in the browser. The other option you have is to go to the share options and check the “share with playlist starting from current video” option. Use these links (preferably shortening them first using a site like bitly.com) to share your videos across the internet. 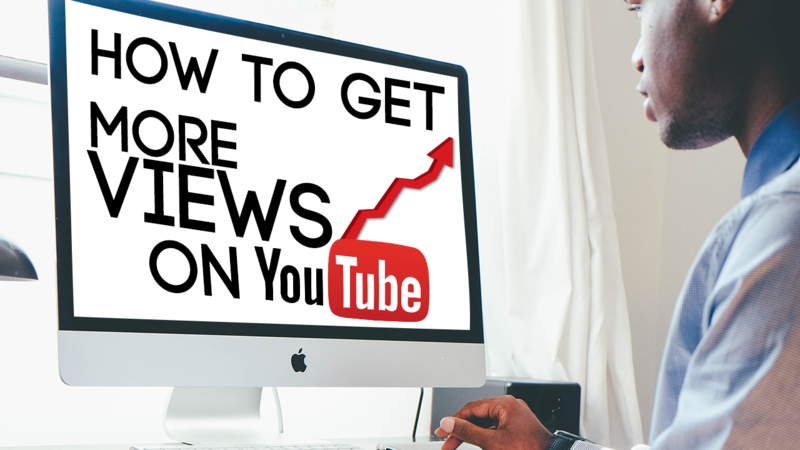 I hope this post taught you how to get more views on YouTube and grow your YouTube channel. I have a bunch more YouTube guides for gamers over on my YouTube channel so be sure to check them out! I recorded this post originally for the Grow On YouTube Podcast. Listen to me discuss how to get more views on YouTube in depth by clicking here.